This is my 100th published post. Wow. I can't believe 100 posts ago I was saying hello to absolutely no one, and now I have written 100 posts. Sometimes it is a struggle, doing this, especially on holidays, when I just want to curl up in air conditioning, swim and eat all day. But other times, it is the best thing I do all day. I love every single comment I get, every single page view. 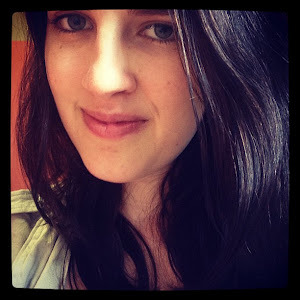 I am so thankful for everyone who takes the time to read this blog. You make me very happy. In other news about me - I got my final marks back for this semester of uni. Safe to say I passed and have one more year left. This time in a month I will be in America with my lovely friend Meg, who lives in Boston. Holidays are going well so far and this weekend is shaping up to be a good one - heading out tonight with my high school girlfriends, tomorrow is one of my best friend's (Will, I've mentioned him before I believe) birthday, and spaghetti pie will be made and consumed over the weekend. Now, onto these amazing danishes. This is probably my favourite thing I’ve made this year, apart from those Skinny Fudgy Banana Peanut Butter Brownies. I absolutely loved these danishes; I love pastry though. These are very easy to make and not that time consuming. If you don’t mind putting in a little bit of extra effort on a Sunday morning within an hour you can have the most amazing danishes fresh from the oven. The apples are soft and perfectly caramelised. 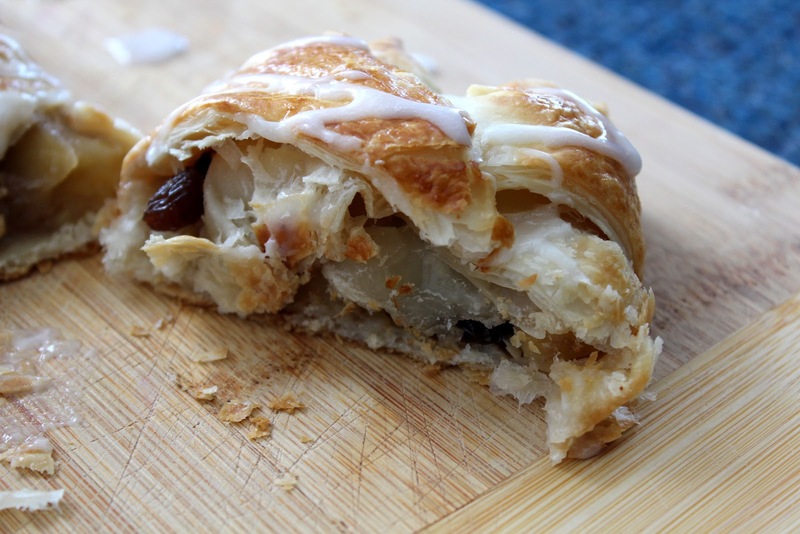 The cinnamon, vanilla, banana, raisins and walnuts really just add a bit of texture, flavour and difference to the danishes. These guys beat regular apple danishes, because of the faint banana flavour, the crunch of the walnuts, and the chewy raisins. 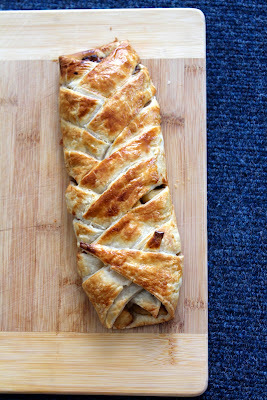 When fresh from the oven the apples practically melt in your mouth, and the pastry is perfectly crunchy. While the drizzle is optional, I definitely recommend it. It is a very sweet icing, but perfectly delicious and very simple to make. It definitely adds something to the danishes; the sweetness of the icing contrasts with the tart apples and butter pastry. Worth the extra minute it takes to mix it together. Makes 2 large danishes. 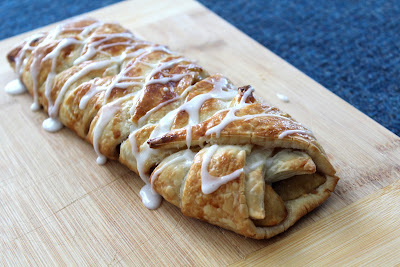 Serves 4-6, depending on how you slice the danishes. Peel and core the apples, and chop into small pieces. In a large bowl, combine the apples, lemon juice and brown sugar. 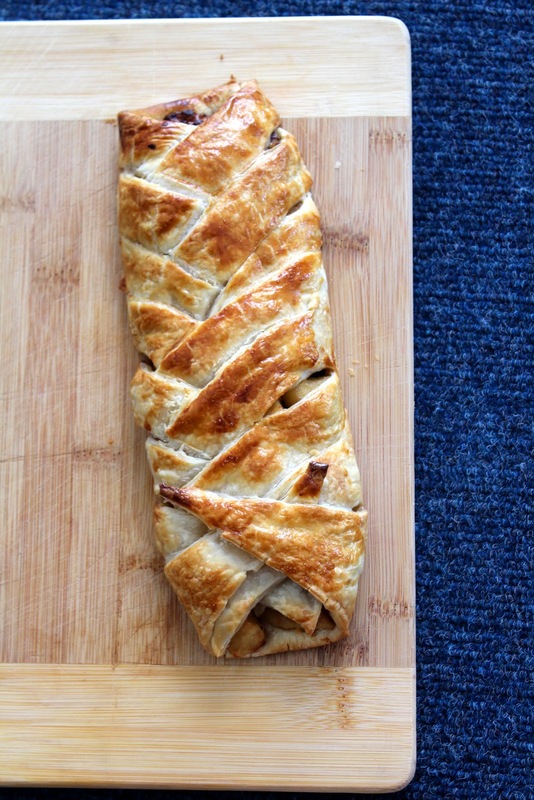 Takeout the puff pastry sheets and allow to defrost. Melt the butter in a frypan over medium heat. Add the apple mixture to the melted butter and let the apples cook for around 10 minutes. Mine took 9 minutes. What you want is the apples to caramelise so they have browned slightly and taste vaguely caramel. When the apples are tender, remove them from the heat. Allow to cool for a few minutes. In a new bowl, combine the walnuts, banana, cinnamon, raisins and vanilla. Mix together well with a wooden spoon. Add the caramelised apples and mix together well. The banana mixture should be rather wet and stick to bits of the apple. By this time the puff pastry should be well and truly defrosted. One sheet of pastry will make one danish. 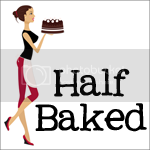 On the left side of one sheet of pastry, make horizontal or slightly angled cuts. Do the same on the right side of the pastry. Make sure the cuts do not meet and instead create a rectangle of pastry in the centre which has not been touched. See related picture. Repeat for other pastry sheet. 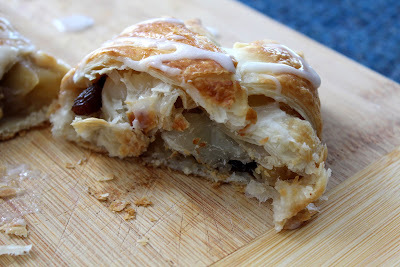 Divide the apple and banana mixture between the pastry sheets so each Danish is filled with half of the mixture. 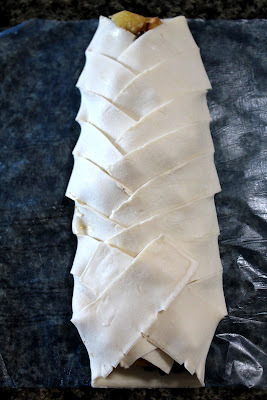 Fold each corresponding strip of cut pastry over the filling, angling the pastry strips down the centre of the danish. The strips will cross over each other. 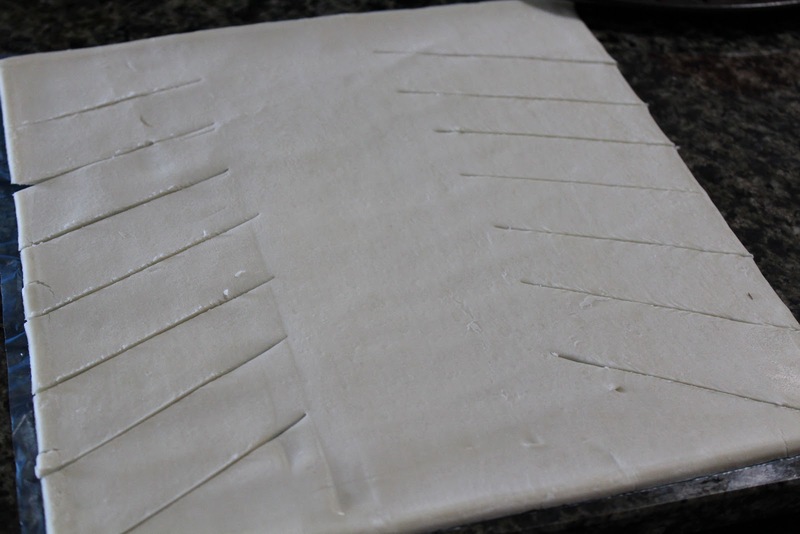 Repeat for the remaining pastry strip, except the bottom two strips. Cross these strips with each other as well, but angle the pastry upwards. This way each end of the danish has an open end. See related picture. Whisk the egg in a small bowl and wash both Danish pastries with it. This will help the pastry to brown in the oven. Bake in the oven for 15 minutes or until the pastry has browned and is crunchy. 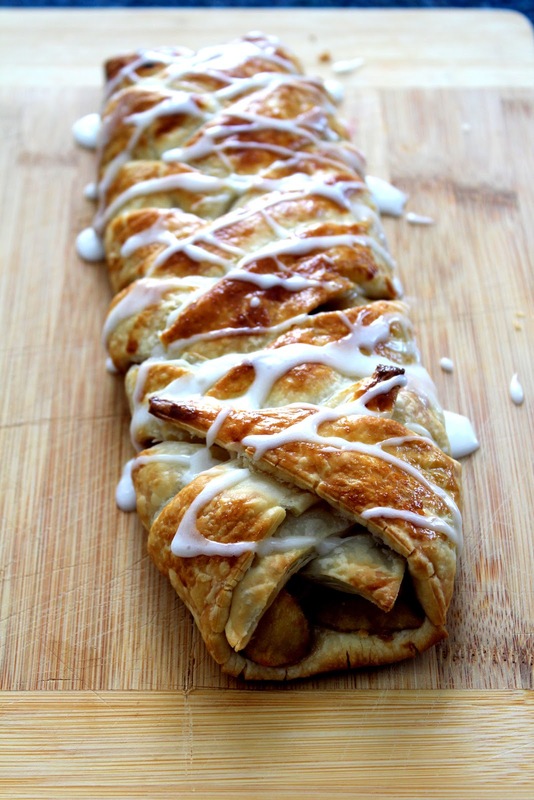 While the danishes are cooling, mix together the icing. In a small bowl, combine the two ingredients. When a thick paste has formed, place it in a ziplock bag. Smoosh the icing into one corner of the bag, cut off the corner and drizzle out the icing over the danishes in any pattern you chose. That's so exciting that you only have one more year to go, and that you'll be living in the states afterwards. How cool girl :) Congratulations on passing all of your finals. Homemade Danish, yum! Congrats on passing your finals!